As a leader, you might have a general sense of the talents and development areas within your department. Your impressions of your team may also inform your ideas about who would replace you if you were to leave your role tomorrow. These potential candidates make up your succession bench, and are usually the first individuals you may turn to when you have training and development opportunities, or to delegate a new responsibility to. However, without a formal succession plan and an objective assessment of your existing talent, it can be difficult to be sure of the strength of your succession bench. 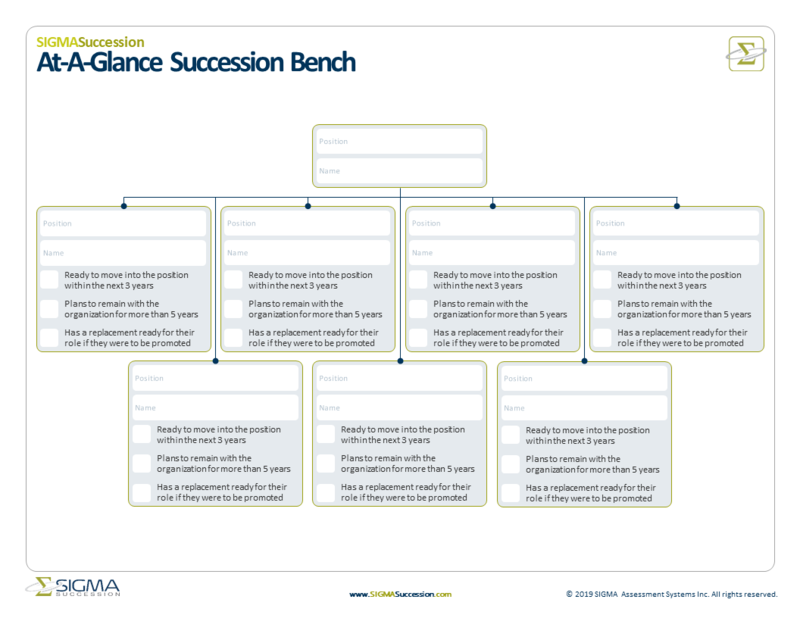 Use our At-A-Glance Succession Bench worksheet to gain a quick understanding of your bench, including areas of strength and of urgency for succession planning. At SIGMA, we have designed a process to help your company be more effective a proactive with succession planning. For more information on our SIMPLE Succession Process or Succession Planning solutions, contact us and learn more about how we can help your organization develop your next generation of talent. Check out our Launch Series for more information on how we can provide your company with a personalized Succession Plan in just 30 days.